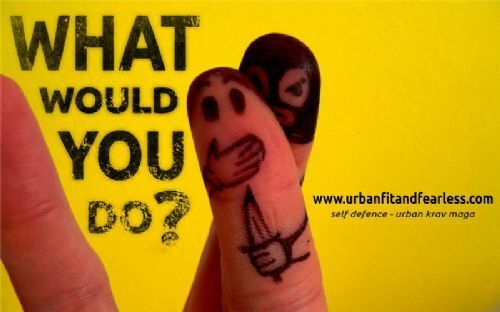 A couple of weeks ago I took myself off for a two-hour women’s self-defense workshop at Urban Fit & Fearless in East Dulwich, to join nine other women and learn how to be more prepared if, heaven forbid, we should find ourselves in a compromising position. Having never been to a self-defence class before, I only had a very basic idea of what to expect from the workshop and was actually quite tentative about the whole thing. This wasn’t helped by my boyfriend, who struggled to resist shouting “UNAGI” at me every time I appeared in a doorway in reminiscence of Ross Geller; I promised him that if he continued to do so after my class he’d end up regretting it! I arrived at Push Studios at 2pm, a little bit nervous but very excited. To start off the session we were all given very clear information about what the workshop was about by our instructor (and founder of Urban Fit & Fearless) Patrice Bonnafoux. The workshop had been designed to teach us how to get up from the ground if we were pinned down – a woman’s worst nightmare – so I was ready to get stuck in. As with most physical activities, the session started off with some warm-ups….and then it was quickly into the real thing. Patrice showed us various moves, each one at a time. Each movement was relevant to its own potential situation. After he had demonstrated each move on a willing participant, we were told to pair up and put what we had just learned into practice. Of course, I went to the class on my tod so didn’t have anyone I knew to pair up with. But luckily for me, there was a lovely girl about my age who was more than willing to let me attack her and within seconds all our inhibitions, concerns about personal space and quintessential ‘Britishness’ were lost, as we fell about on top of each other for the following two hours. Although I started out somewhat sceptical about how I could get a potentially strong and large man off of me, Patrice explained and demonstrated very clearly and adeptly that these moves were more about leverage than strength… I always knew physics would come in useful at some point! Having mastered a variety of kicks, rolls, hooks, face smashes and moves that would win us space to manoeuvre, we were ready for the final test. In the last 10 minutes of the workshop, it was time for us to put our training into practice. Each of us were going to spend five minutes being relentlessly attacked and pinned down by our partners and it was our job, as the ‘victim’, to get back on our feet and run. Of course, before this, Patrice ordered us to spend one minute lying on our backs punching and being punched by boxing pads to tire us out. This worked a charm. As I started to be attacked I managed to get up ok the first time, but after a few stints, you realise how exhausting it is and, more importantly, how exhausted you would be in real life if this were to actually happen. When Patrice came to attack me it really tested what I had learned and what I was able to remember when under pressure. I was able to fight him off by implementing the leverage concepts and by ramming my palm (not at full force, mind) into his face. It was only when he told me to stand up and run that I ended up tumbling like a Jenga tower to the floor, only to be attacked again. It was at that moment I suddenly felt remorse for having heckled a Hollywood movie when the woman conveniently falls over when trying to get away. I found myself sympathising with said thespian as my arms had turned to jelly and my adrenaline had transformed me into a bit of a sweaty mess. I came away from the session feeling much more confident and prepared. Patrice explained that we wouldn’t ever remember the moves exactly if this ever happened to us, but after the workshop, we would have the basic knowledge of how to get free, whether it is by merging three moves together or using one and then improvising, at least something would come back to us. That night, much to my dismay, my boyfriend chose not to shout UNAGI at me as I walked through the door. Our Verdict: A fantastic introduction to self defence, comprehensive teaching and great fun… even if it does leave every muscle in your body aching for a couple of days afterwards.